Big Bluestem Grass, also known as turkey foot, is a hardy perennial native to the Great Plains. It will reach its full height of 5-8 feet in its first year of growth. Big bluestem grows in large clumps that add a natural, nostalgic feel to any landscape. During spring and early summer, the tall stalks of grass are a vibrant, vivid green. In late summer and fall, they change to an attractive reddish bronze and produce a three-part seed pod that resembles the foot of a bird, hence the plant’s nickname. In addition to being visually appealing, big bluestem grass has many environmental benefits. It helps prevent erosion and can be used as an eco-friendly feed for livestock. Livestock feeding on the grass not only helps save costs of feed but also helps to keep the grasses size under control. It is often included in restoration projects aimed at revitalizing prairie ecosystems. This item ships bare root. 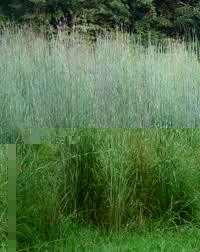 Big bluestem grass thrives in Zones 4-9 and almost all soil types. As this plant originated in a prairie environment, it is capable of tolerating arid, nutrient-poor soils. It may be planted outdoors in early spring, or started indoors in a greenhouse; If starting in a greenhouse, plant 6-10 seeds per nursery pot. Water regularly and thin after one month of growth. After the danger of frost has passed, transfer seedlings outdoors and plant 2-3 feet apart. If starting outdoors, plant seeds 1/4 to 1/2 inch deep and water regularly. Grasses are beneficial to areas as they help provide food and shelter to small and large wildlife. It is never a bad thing to give back to the environment. Sprouts should appear within four weeks. Big bluestem does best in full sun. Once started, Big Bluestem Grass requires little maintenance besides regular watering. I love the height of this grass.